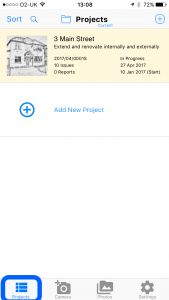 Site Report Pro allows you to record multiple issues for your project (e.g. a site inspection, site audit or punch list) along with multiple photos per issue. 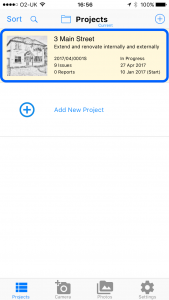 Click the Projects tab at the bottom (if necessary) to display the projects screen. 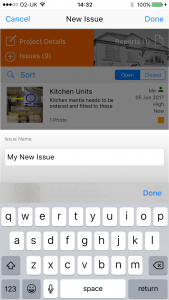 On the project screen, click the project to which you want to add one or more issues. Click Add New Issue in the issue list or click the Add (+) button in the orange header bar. Enter the name of the issue in the box that appears and then click done. 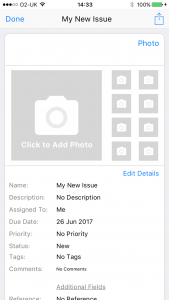 It is also possible to create a new issue immediately after taking a photo or browsing your photo library within the App. In the tab menu at the bottom of the screen click Camera to take a new photo or click Photos to browse the photo library on your device. When you have selected your photo, click Add as New Project to have Site Report Pro automatically create the issue in a new project. 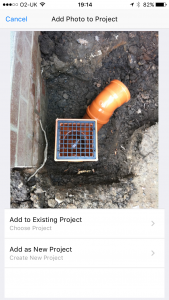 Alternatively, click Add to Existing Project and follow the instructions to add the photo to an existing issue or add as a new issue in your chosen project. The project details can then be entered by clicking the Project Details button.